In honor of World AIDS Day, and this year’s theme of “Know Your Status,” the Coalition asked each of our Ambassadors why it is so important for people to know their status and what they think may be standing in the way. Our first discussion took place with Jacquelyne Alesi, a young mother in Uganda. Jacquelyne set up and, until recently, ran Uganda Network of Young People Living with HIV&AIDS (UNYPA) and is now Executive Director of Friends of Canon Gideon Foundation (FOCAGIFO). She also is the young person representative helping to design Uganda’s national guidelines for psychosocial support for people affected by HIV. 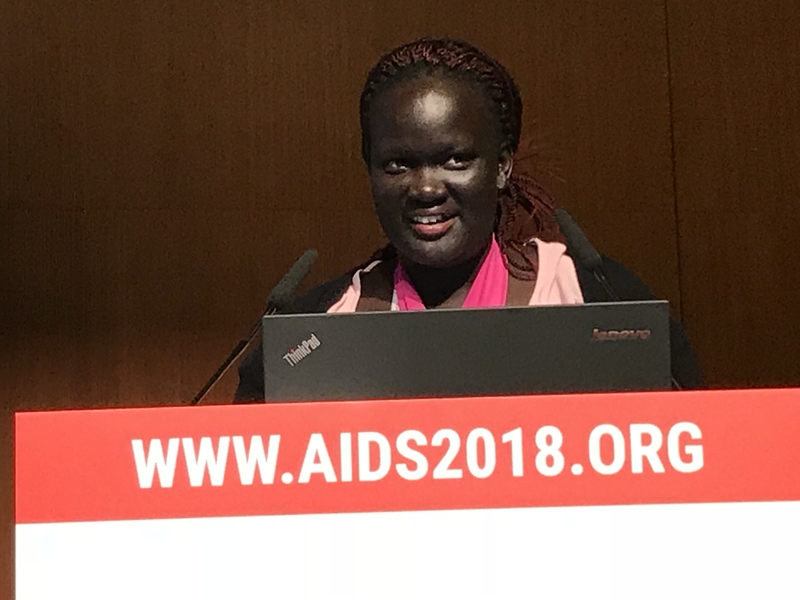 Coalition Ambassador, Jacquelyne Alesi, presents at the AIDS 2018 Conference in Amsterdam. When and how you did you find out about your own status? When I was 16, I became pregnant and had a son. After he became sick and passed away, I also became ill. My father encouraged me to go to Naguru Teenage Centre. It is one of the best, most adolescent and youth friendly centers. But it was one of the most difficult decisions I ever had to make. Learning that I was HIV positive was the worst and most shocking news I have ever received in my entire life. When I returned home from the clinic I locked myself in my bedroom. When my dad came to find me, he said, “I know the reason you’ve locked yourself in. But don’t worry, I am here for you and I will be there for you always.” Thankfully, I had support from my family. Many people, when they find out their status, don’t have that support. What were the biggest challenges you faced in finding out your status? Some of my friends disclosed my status before I was able to. They also disclosed the fact that I had lost my child. Because of that, I was forced to change schools. What is the biggest challenge facing young people today in knowing their status? Disclosure without consent is one of the biggest challenges. When young people are diagnosed with HIV, they start having self stigma. For example, when I saw people talking and laughing, I assumed they were talking about me. I thought everyone knew about me and was laughing about it. Or I would think, “Why are other people able to laugh and be happy when I am struggling?” You want everyone to think and be like you and to have the same struggles. There are also challenges around relationships. It’s very hard for someone who is HIV positive coming from a family that is negative. There are issues with illiteracy. There are a lot of myths and misconceptions around HIV. Having people come to talk to them, to educate them about HIV really helps to stop stigma in homes and families. I was talking to a young man recently whose wife did not disclose to him. She kept her medicine at her mother’s place and he was not aware of her status. She was breastfeeding their child when she knew the risks involved. After the young man fell sick, he was told that he was HIV positive. He was so stressed because he didn’t know how to tell his wife! When he did, she told him, “I knew I was positive.” The baby has also tested positive. Think about relationships when your 15, 16,17 and you’re HIV positive and what’s running in their heads at that age. People ask me how I did it – but I had to make a commitment to myself that I wasn’t going to get into a relationship without telling the other person about my status. It is always good to disclose before getting involved with someone. Let someone go if they aren’t supportive. What kinds of programs, services and support would help young people in determining their status? Boys and men are a big challenge; they are often left out of information. That is one of the steps that we are missing. If you don’t tell a boy to support someone who is HIV positive, how will they know how best to support someone who discloses to them? There is a lot of information online, but we still need face-to-face information. We still need people to share their stories. Information is key. Let’s try and give out new information, right information about disclosure, discrimination. These things will help. What, in your opinion, is the greatest accomplishment for children, adolescents and families in the time that you have been involved in the fight against HIV/AIDS? It’s an accomplishment to hear from people like me who openly talk about their status. Before, we would only hear the adults; it was very rare that you would hear a young person talk about their status. The targets have helped in shaping the face of HIV. It is a big achievement to have people living openly with HIV and to be given the opportunity to enter into relationships that are non discriminatory. What are the greatest challenges that remain for children, adolescents and families in the fight against HIV/AIDS? We also need more family supports for children living with HIV. I know many parents and guardians are giving some support, but it’s not enough. Children are still stigmatized. On this World AIDS Day, what message would you like to give the world? We over do a lot of the blame game. If you blame the other person, what have you done? My message is simply: I believe we can achieve more if we blame less.